How many crushes are too many crushes? Tell me now, like really. I have been majorly obsessed with the Salvatore brothers, the Ridiculously Photogenic Guy, Ranbir Kapoor, Shahid Kapoor, John Green quotes, half a dozen songs and singers. Oh, and majorly hot ones in the latter. I sometimes feel its criminal to keep your heart set on so many people entities. So the other day, I was adding on to the list of my crushes, and I realized my first crush, my first love wasn't in there. The color pink. I looked down at my nails and felt like I had cheated on pink, you know? Of not having painted them pink in ages. For having chosen peaches blues and goldens. I felt the hurt piercing me from inside, and without my knowledge, my fingers were racing for the nail polish remover, cotton and Maybelline Color Show Fuschia. It was time to correct the wrongs, and I did it with nail art. Okay, so after a long time I did a simple leopard print nail art and here it is, complete with details. And here is the nail art. Its crazy simple and hardly takes minutes to finish. 1. 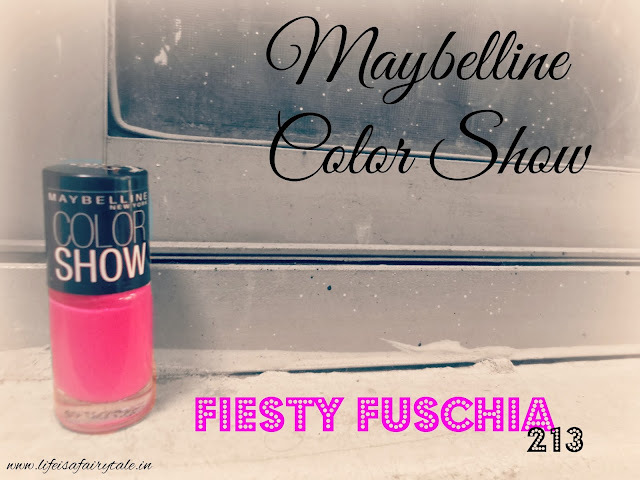 Paint your nails with Fiesty Fuschia 213. 2. Allow it to dry. 3. Using a nail art pen (or tooth pick), draw simple borders with black. You don't have to be precise, messy looks equally pretty. 4. Use a rich color to keep the spots. I chose green as its a nice contrast against the pink. I have used a cotton swab to dab the green as it looks abstract. The cotton gives a cotton like effect (?!). 5. Seal with top coat. 7. Preen and take a dozen Instagram pictures and pose and pout. PS: Step 7 is optional. Step 6 too. Very optional. PS: The product was sent by PR for review purpose. My opinions are mine, hand on heart. awwww the nail art is super cute!